During one of my teaching internships, my mentor had us create books we read to children from the Boys and Girls Club. I still have my construction paper book with my poor drawings. My artistic abilities didn’t matter to the kids who were just excited to have someone spend time with them. Our learners have the power to greatly impact others with their creations. 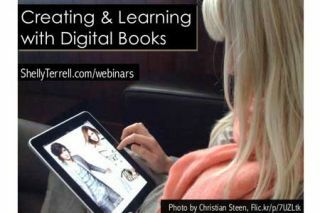 Fortunately, several free web tools and apps help students quickly and easily create and publish digital books. Keep scrolling to access my bookmarks of free web tools and apps for creating digital books on any device. I’ve included some ideas below and a slide presentation with tips and resources to get students creating digital books that help those around them while learning. Our family recipes and traditions cookbook- create a class cookbook in which students share a traditional recipe and include information about the traditions and origins of the dish. Students can interview family members to discover the history behind the dish and the traditions surrounding it. Special diet cookbook- students can work in pairs to create cookbooks for those with different allergies who require special diets or for vegans and vegetarians. Science experiments you can eat- students can learn the science behind making homemade ice cream, taffy, or fizzy potions. Check out these bookmarks for ideas. Digital scrapbook- students can take their paper scrapbooks and transform them into digital scrapbooks so that they preserve these family memories for life. Nature book- students work with the local park or campsites to document the plants, animal life, bugs, birds, and other species that visitors will be able to see. Students add important resources and information like maps, diagrams, images, important facts, and more. Many local parks have these documented onpaper and could benefit from having a digital book that encourages people to spend time outdoors visiting the park. Goal journals- students can work in pairs or small groups to create journals for specific goals like a runner’s journal or study journal. They leave entries for each day of the year for people to record their progress and reflect. Each entry can include songs, quotes, anecdotes, famous people, interviews, Ted Talks, and other motivational resources. Learning books for younger relatives or for a class of young learners- your students can create books that teach children the alphabet, animals, to be better citizens, or are full of jokes related to science, math, history, or grammar. Students can visit the class and read them their digital books.